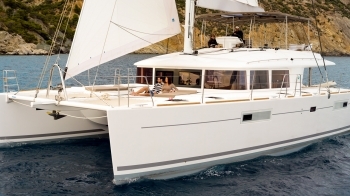 AMAZING BLUES is a 2015-launched, 56’ luxury Lagoon catamaran that is replacing the older Lagoon 57s from the 1990s…. There is quite a big difference between them. 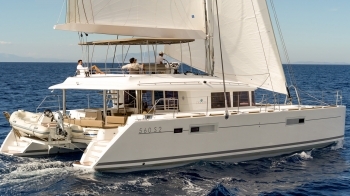 Although only 56’ overall, AMAZING BLUES has considerable more space and amenities than the older Lagoon 57s. Starting with the air conditioned saloon, this space is now open concept and modern with straight, chic lines with galley to port and cocktail seating-come-dining table to starboard. 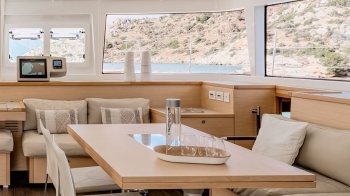 The dining table in the saloon folds away to a small coffee table, so there is comfortable seating for all to be able to enjoy the modern deck saloon with its chic lines and natural light…. 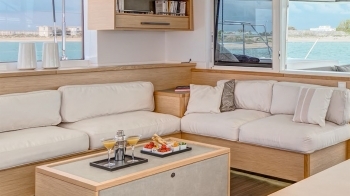 This saloon opens out to a large covered, teak, walk-in cockpit, which is on the same level as the saloon and offers dining plus casual seating, a wet bar, and a spiral staircase to the flybridge. 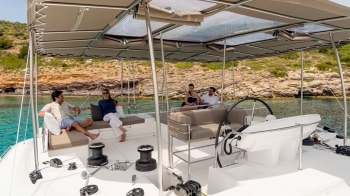 Unlike the older Lagoon 57s, the Lagoon 56s now have a fly bridge with full-fledged lounge above the cockpit with sunbathing double bed, ideal for sunning, sailing, and watching the sun go down. The upholstery is in grey cotton with blue and white throw cushions, and flower bouquets are everywhere. The panelling in the saloon is cherry with wood floors. There’s a pop up TV. The crew prepare beautiful hors d’oeurves, a coffee bar, and infused water choices. 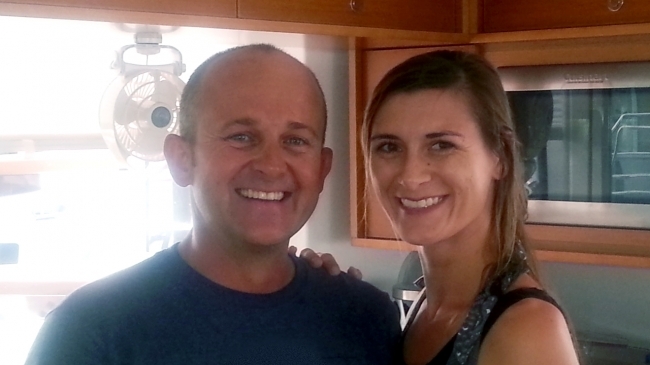 South African captain John Crafford and pretty chef/stewardess Shirelle are both tall and thin and wear fun, aquarium gray T-shirts over gray shorts or skirts. 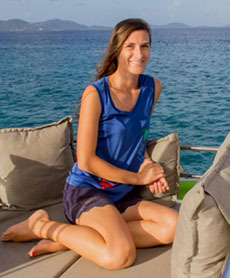 They’ve been running yachts in the Caribbean since 2011 and create a good first impression. 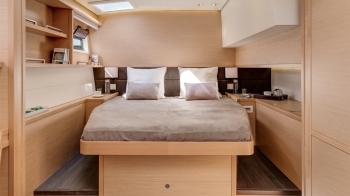 They encourage guests to sleep on the double bed up on the flybridge, if they like…under the stars. Beautiful guest cabins each have their own stereo, climate controls, ensuite bathroom, fresh water electric flushing heads, black out blinds, screens….There’s an onboard washer and dryer. The yacht sleeps eight. 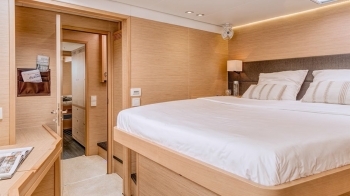 One stateroom is a master cabin; another is a VIP Queen, and the other two guest cabins each have Queens, but the crew will give up their bunk bed cabin for one of the guest queens if single beds are needed…. 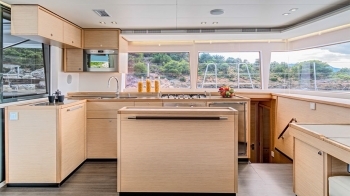 The galley has tons of refrigeration, a wine cooler, dishwasher, and John and Shirelle offer outdoor drinks and use every opportunity to fish for supper, and usually that includes homemade Sushi! 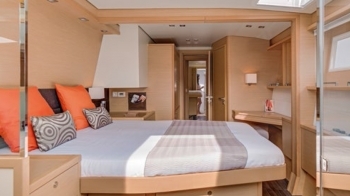 The master cabin has an in-room glass shower with frosted shower stall, as well as a large glass hatch that opens into the cockpit, as well as a walk through hall that opens into the main saloon. It has an Apple TV, white sheets with tan blankets and cotton shell throw cushions in blue and white, candles, and Memory Foam mattress and pillows. Every guest cabin has a hair dryer and leather pouch…. The VIP Guest Queen has a glass hatch that opens into the cockpit, as well as a walk through to the main saloon. The forward guest cabins have a large window which provides an abundance of natural light. Crew Twin cabin is midship. All cabins have abundant storage, hanging lockers, and shelves. AMAZING BLUES is fully air conditioned throughout. Enjoy Xbox 360, big screen TV and media server in saloon. AMAZING BLUES has enough electric power to run all her appliances simultaneously. There are music controls, auto pilot, VHF, bow thrusters, chart plotters, wind instruments, depth guage, and compass in aid to navigation and piloting… The whole boat can be steered by remote control! 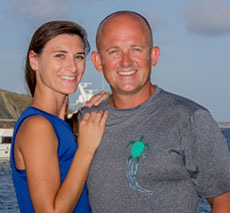 Captain John couldn’t be nicer, and he and Shirelle will do everything to make your cruise wonderful! The owner of AMAZING BLUES also owns the identical 56′ Lagoon AMAZING LADY, as well as the larger 62′ Lagoon AMAZING. If AMAZING BLUES is not available for your dates, you could consider one of her sister ships. They are all very good yachts…. Cabin Rates are based on double occupancy. If individuals require a cabin each, the double occupancy rate applies. 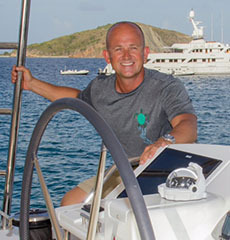 AMAZING Fleet is Available for Discounted US/BVI Tandem Charters until Dec 16, 2017. Book an Amazing fleet, 5-star service for up to 26 guests, kindly enquire for 30 guests, families, friends, celebrations, corporate retreats. 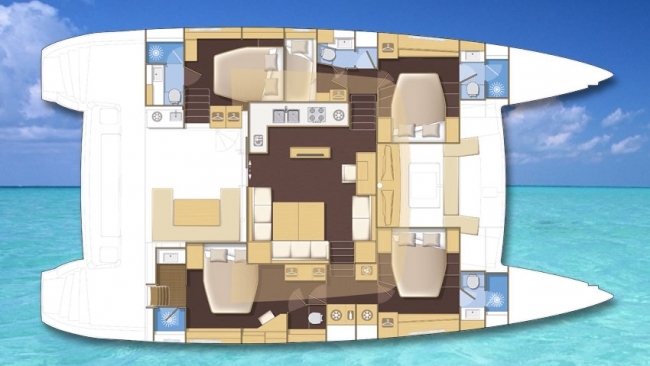 AMAZING 2015 Lagoon 62, 10 guests in 5 deluxe cabins. 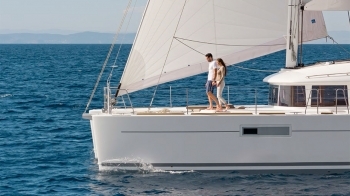 AMAZING BLUES 2015 Lagoon 56, 8 guests in 4 queen cabins. AMAZING LADY 2015 Lagoon 56, 8 guests in 4 queen cabins.